Chiropractic is unique in its approach to health as a healing art. Instead of approaching the body as inherently weak, needing outside help, we look at the human being as a whole (many systems working together for the good of the whole), understanding that we were created with an innate ability to heal ourselves, from the inside out. As principled chiropractors, we do not attempt to improve how the body works by selling vitamins, pillows, shoe inserts, doing physical therapy or spinal decompression. 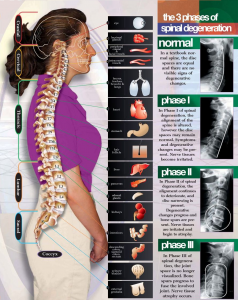 We affect how the body works by correcting spinal misalignments (subluxations), which restores the connection between the brain and body. This usually results in relief (of secondary conditions such as pain), but more importantly, results in better system function (which is the primary condition - a loss of nerve flow from the brain to the body).